The Thai Pool Villas come in various sizes from two to four bedrooms and up to four bathrooms. All villas have lots of space for a big family and have a big lovely private garden with pool. The luxury furniture and decoration package also includes airconditioning and and a fully equipped modern kitchen. The villas are designed for practical use with western buyers and visitors in mind. Along the 10 km beautiful beach road right outside the VIP Chain resort you will find local vendors, small traditional Thai restaurants and of course lots of space for beach activities. A quiet area away from mass tourism, but still with Rayong city and modern shopping malls just a few miles away, and with Bangkok and Pattaya within reach for a day trip. 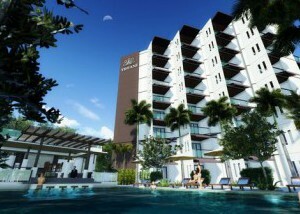 The villas are located inside a quiet and safe resort area. The resort is designed for all three generations and offers a club house with a big pool, big Jacuzzi and a pool bar together with a good restaurant serving both Thai and western food. There are various activities including a tennis court and mini golf. There's even a luxury Spa and Massage Health Care Center with various treatments for body and soul. We can rent out your villa when you don't need it yourself. This can give you up to 7% yearly guaranteed return of the total investment including the interior package. We can also offer you a re-sell contract (exit strategy) with a guaranteed profit and a guaranteed maximum market time. Then you can sleep peacefully at night. Nothing can really go wrong. - So how do you buy a Thai Pool Villa? We will take care of all communication with Thai authorities and we will handle all documents for you. You only need to pay a small reservation fee, and then pay instalments gradually as the construction completes You get a deed issued in your name. If you want to buy property mostly as a good investment, then you can let us rent it out for you with a guaranteed yearly return of investment up to 7%. You can still use your villa yourself for free for a total of 14 days every year. It's safer than you think! VIP Real Estate, Co. Ltd. has 18 years of experience on the Thai market and we're with you all the way. We can even offer you a re-sell contract (exit strategy), so you are guaranteed to be able to sell your villa with a guaranteed profit within a maximum market time. Nine lovely houses located around a closed pool garden. a broad selection of holiday homes for rent and sale.